In this life, where we seem to add more items to our to-do list than we have time to check off, I’ve found that planning a craft night with my girlfriends is one sure-fire way to get a craft I’ve been dying to make made, err, at least started. As far as I’m concerned, there are two guidelines to hosting a craft night: choose a craft and promise dinner. 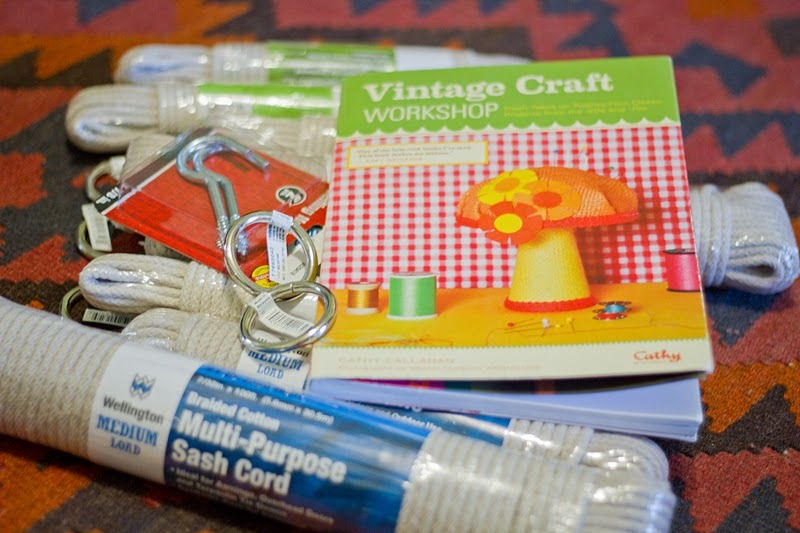 My craft of choice was the Macramé Hanger from my friend’s super cool book, Vintage Craft Workshop: Fresh Takes on Twenty-Four Classic Projects from the '60s and '70s. For dinner, I wanted something simple, something meatless (There was one vegetarian crafter in attendance.) and something autumnal, despite the fact that autumn has been a complete no-show here in Los Angeles. 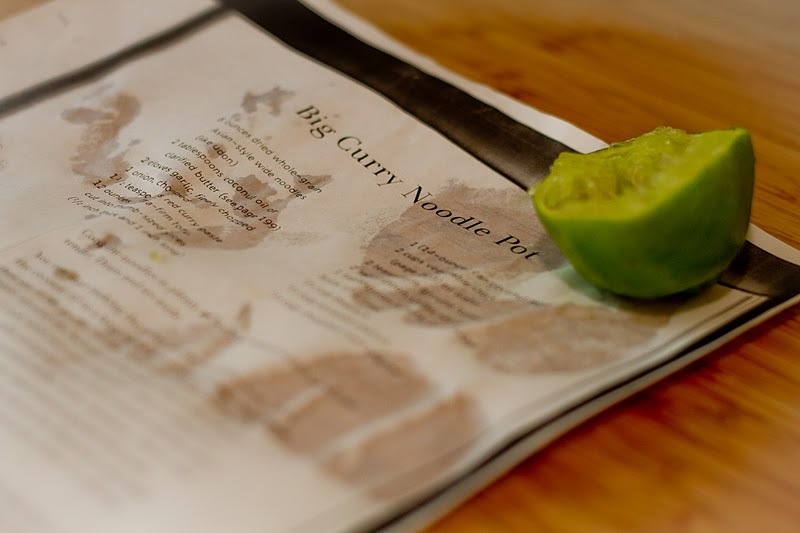 I found all of these requisites well met in a recipe titled Big Curry Noodle Pot in Super Natural Cooking—a cookbook that had eluded me until now. Curry and crafting—here we go! As you can see, I ended up dyeing my finished product purple. If I had been able to find bright white rope (or bright any-color for that matter), I don’t think I would have gone this extra step, but the rope I had bought was this sad beige color. 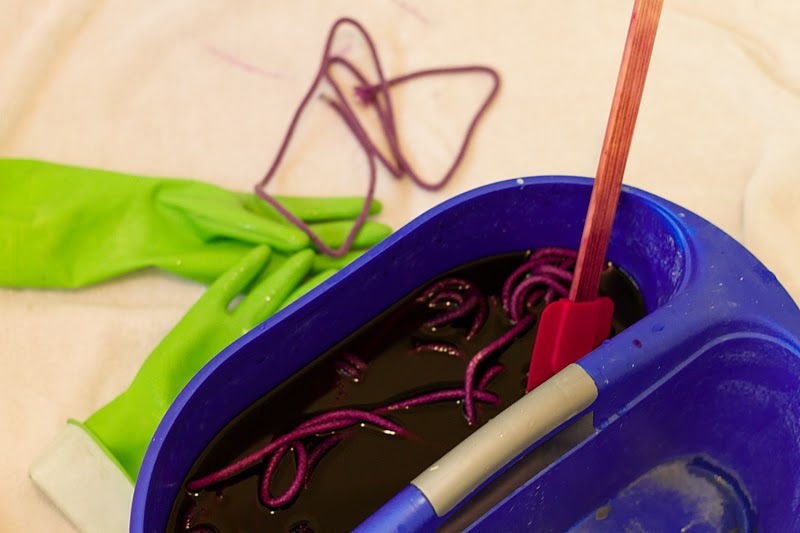 In the end though, I’m kind of glad that I couldn’t find any colored rope—I’d never dyed anything before and it was a supremely satisfying experience. Almost as satisfying as tying my very first Josephine knot. I guess that’s why the saying goes: “Money can buy you a lot of things, but it cannot buy you the satisfaction of tying your very own Josephine knot.” That is a saying, right? The curry was a success too, and definitely something I will turn to if Matt and I redo the three-week vegan challenge we did last winter. That said, perhaps the next time I’ll try it with the full fat coconut milk as this version left me hungry a few hours after dinner. But then again, maybe I was just spent from having tied all of those hyper-satisfying J-knots? Sidebar / craft-night discovery: the definition of macramé is “the art of knotting cord or string in patterns to make decorative articles.” Who knew? This whole time I thought it just meant: weird rope-stuff from the 70s. Meanwhile, heat the coconut oil in large saucepan over medium heat. Stir in the garlic, onion and curry paste, stirring until the curry paste is well incorporated, 1-2 minutes. Add the tofu and gently stir until coated. Stir in the coconut milk, broth, curry powder, shoyu and sugar. 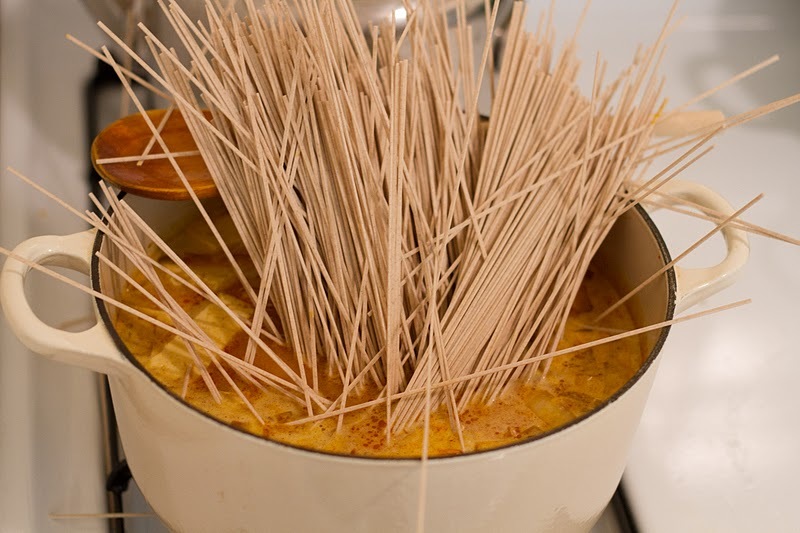 Bring to a slow simmer and keep it there for about 5 minutes. Remove from the heat, add the lime juice and noodles, and stir. Add the noodles and some extra both to each of 4 bowls. 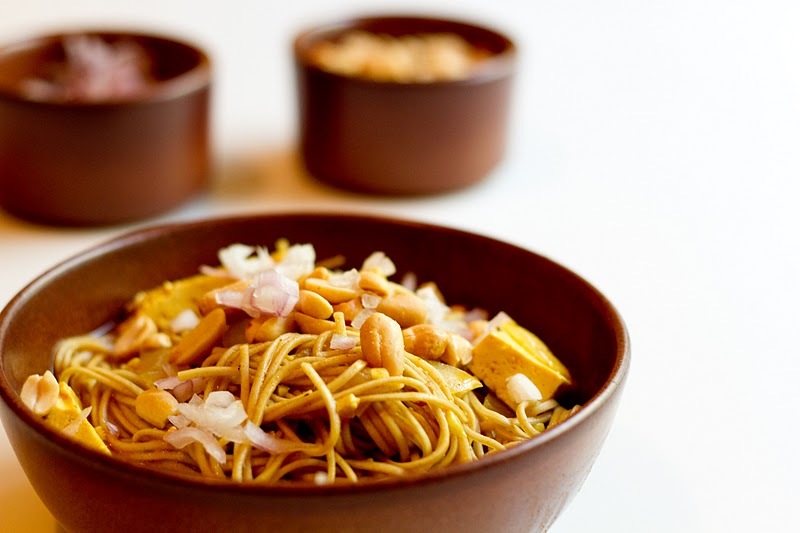 Top with the shallots and peanuts. This sounds SUPER satisfying! Wish I was eating it tonight. Wish I could join your craft nights too! MARE!!! So quick on the draw -- do NOT count on this happening again. 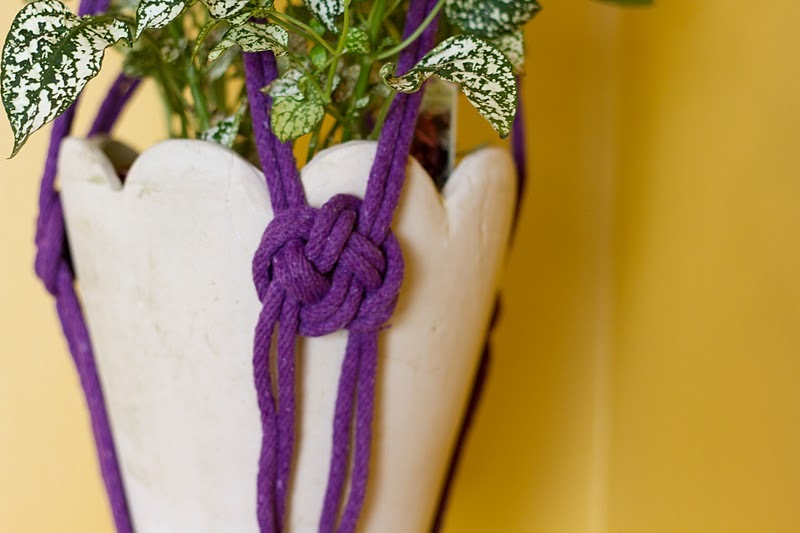 Love our new rope planter! Awesome ceiling hook; how'd you install that awesome ceiling hook? so sad i missed curry & craft night!!! i heard it was fun and funny?! Macrame has never looked so COOL!! I'm off to amazon the book so I can make some to hang in my office. Perfect for the empty corner by the window. Curry looks yummy too. Thanks for posting!! Your adventures are so fun! I've definitely been meaning to start a craft night with my girlfriends but haven't had time :( Crafts, food and friends. What could be better?! BTW your finished product looks really cool, love that color! so fun!!! the noodles were so yummy. I need some of that curry right now! Looks great. It looks really good and you would think that there are too many things in there but I bet it was great! Looks yummy! Making a curry dish is on my "cooking" bucket list. I'll have to give your recipe a try! Cozy cozy cozy beautiful, ya maui babe! this looks like a ton-o-fun. My friends and I have a craft night too, I'm totally putting these plant hangers on our to-make list! Thanks for sharing. That curry pot looks great, if only I had some colorful macrame to look at while eating, ha...seems like it would work well with some vegetables thrown in too, no? Crafting with friends is always so much fun! I really love Super Natural Cooking, particularly the Wheat Berry Salad in there. I like your rules for hosting a craft night, such a classy host! My friend Meiko photographed that book, I loooove it! I've been on the hesitant side of buying that cookbook, but this looks goooood. I have been haunted by this purple (so impressed) ever since I read the post days ago. I get it now: it is the Grateful Dead Purple from so many kids' tie-died shirts in my (ironically Connecticut-saturated) youth. Curry, Rope, Mop Bucket: Well done, A! I love that you have a craft night with your girlfriends. These kinds of nights are so much fun and when you throw in a cozy dinner, it's a good thing. We've been learning how to play bridge with our friends and dinner is a requirement for these nights. 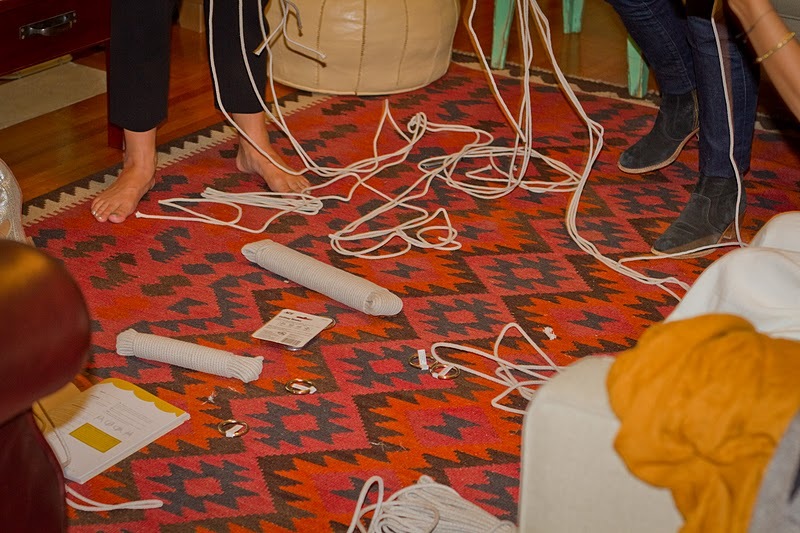 I love that you are attempting macrame, such a memory from the seventies! Just wanted to post and say that I ended up making this! I used full-fat coconut milk so flavor/richness was definitely not an issue. I actually found it a bit too rich. There wasn't enough broth to counterbalance the rich coconut milk, in my opinion. The flavors were good though so I'd make this again for sure-- with a bit more broth!